Ferrol Sams , Down Town. Sams was born to Mildred Matthews and Ferrol Aubrey Sams, Sr. The younger Sams lived in a house built by his great-grandfather. He married Helen Fletcher on July 18, 1948, who was also a physician. 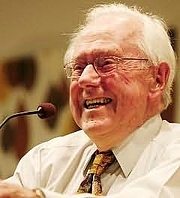 Sams' medical career started at Mercer University in Macon, Georgia, which he graduated from in 1942. He then attended Emory University School of Medicine for only one semester, and then joined the United States Army Medical Corps. After serving from 1943 to 1947 and seeing action in France, Sams returned to Emory to continue his medical studies. He received his M.D. in 1949. Both Sams and his wife, Helen, practiced medicine in Fayette County until they retired in 2006. Sams is affectionately known by his family and a few close friends as "Sambo". Sams has four children—Ferrol Aubrey Sams, III, James (Jim) Sams, Ellen (Sams) Nichol, and Fletcher Sams. Ferrol, III and Jim are both medical doctors and practice in Fayette County. Ellen is a hospital administrator where her brothers practice and Fletcher is a Fayette County Judge. While at Mercer, he was initiated into Kappa Alpha Order by the Kappa Chapter. In 2001, he became the nineteenth recipient of Kappa Alpha Order's highest honor, the Distinguished Achievement Award. Sams wrote eight books, including a trilogy of works featuring Porter Osborne, Jr., a character who appears to be largely based on Sams himself. Sams's writing drew heavily on southern storytelling tradition. Run with the Horsemen was Sams' first book which he published in 1982 when he was 60. In 1991, Sams was awarded the Townsend Prize for Fiction for his publication of When All the World was Young. Sams's works of fiction developed from the act of writing his own memoirs of growing up in rural Fayette County, Georgia, for his posterity. His works are generally set during the Depression and feature several eccentric characters. Sams has been the subject of several community reading programs: Run with the Horsemen was chosen as the 2006 Atlanta Reads selection, and Down Town was selected for the 2007 Gwinnett Reads by the Gwinnett County Public Library. Sams died January 29, 2013, according to Mercer University. Ferrol Sams is currently considered a "single author." If one or more works are by a distinct, homonymous authors, go ahead and split the author. Ferrol Sams is composed of 2 names. You can examine and separate out names.